Back in the 1970s, grain transport in the Canadian Prairies was in trouble. The railways weren't very interested in transporting grain because their revenue was limited by the Crow's Nest Pass Act Agreement. This agreement between CP and the federal government fixed the freight rates on grain and flour forever, in exchange for federal subsidies to the CPR. It sounded like a good idea at the time but the rates were far below other freight rates by the middle of the 20th century. This was known as the Crow rate. The Crow Rate was ended in 1984 by the federal Liberal government and transport minister Jean Luc Pepin, through the passage of the Western Grain Transportation Act. The government continued to subsidize the shipping rate and recently this subsidy has been replaced by the the rail revenue cap. Farmer's subsidies are complicated! While the Crow Rate was in effect, there was no incentive for the railways to maintain the lines and no incentive to add new grain shippers. CN and CP weren't maintaining Prairie branch lines and many lines still had very light rail, limiting car weights to 177,000 lbs/car and therefore only permitting boxcars to be loaded. Loading boxcars with wheat is very time-consuming and labour intensive. 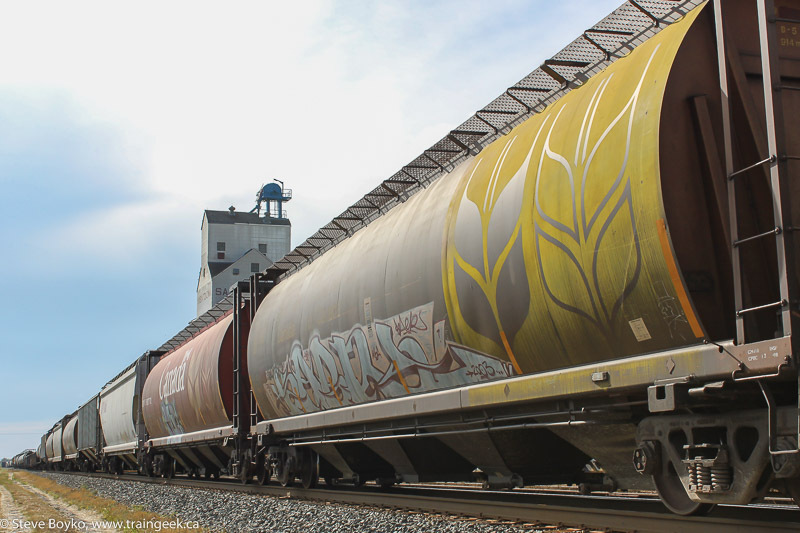 Here's a great article on CP's grain boxcars. After several studies, the federal government decided to invest in grain transportation to the tune of greater than $1 billion. 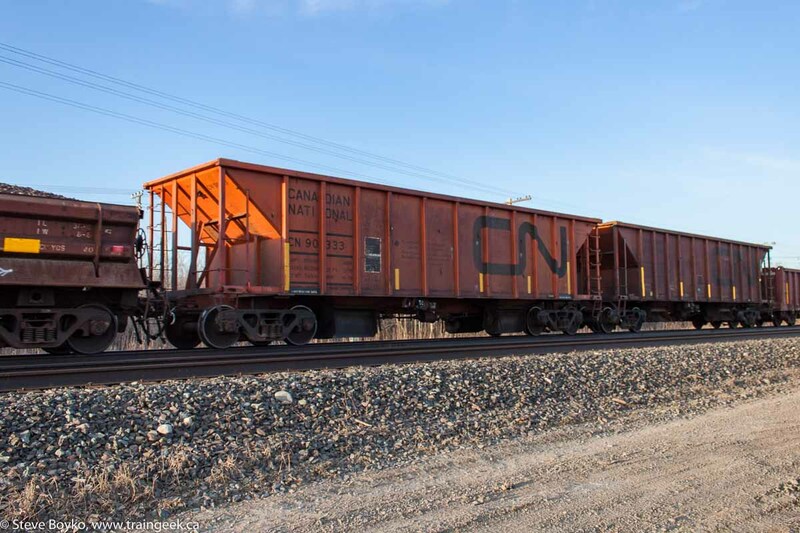 They purchased 13,500* cylindrical "Coke can" grain hoppers between 1972 and 1994 and assigned them to CN and CP for maintenance and operation at no cost. This greatly increased the size of the fleet to transport grain (and allowed retirement of most grain boxcars), but required more robust track and roadbed to handle the increased car sizes. * The number of grain cars purchased doesn't appear to be certain - many sources quote 12,400 and some quote 13,500. It is also not clear whether this includes the 2,000 aluminum hoppers purchased between 1975 and 1978. Those were not very successful due to structural issues and the last was retired in 2009. Note that Saskatchewan purchased 1,000 cars in 1981 (900 remained by the end of 2015) and Alberta purchased several hundred. Here's a good article on the uniquely Canadian grain cars. The government spent hundreds of millions on prairie branch line rehabilitation to support these larger cars, which was in essence a direct subsidy to the railways. Good thing this was before free trade! In order to receive the subsidy, a line had to be "grain dependent" meaning that 60% or more of the traffic on the line was grain. The Prairie Rail Action Committee determined which lines would receive the subsidy to be upgraded to be able to handle the 263,000 lb. cars that were purchased by the government. Lines that did not receive rehabilitation were essentially doomed. The railways owned the lines after rehabilitation. In many cases rehabilitated lines were eventually abandoned, and the relatively new rails were lifted and reused elsewhere. The railways purchased ballast cars that were funded by the rehabilitation program. These cars were stencilled to reflect this funding but were owned and maintained by the railways. Series CN 90000-90479 were built by National Steel Car in the late 1970s as open top hoppers. These cars were painted orange with a large black CN "noodle". One side says "CANADIAN NATIONAL" and the other says "CANADIEN NATIONAL", which was typical for CN freight cars. I don't think they have been modified much since construction with the exception of reflective stripes added for greater visibility, and the replacement of the colourful Automatic Car Identification (ACI) visual labels with today's wireless AEI system. These cars are still in service on CN for maintenance work. One can often see them in yards or at work on the road. They are obsolete compared to the modern automatic unloading ballast trains such as the Herzogs but they are fine for spot work. Marine Industries built CN 91000-91143, a set of flat bottomed gondolas with side gates to dump ballast on the outside of the rails. These cars are painted a more typical CN boxcar red with a lot of lettering and a white CN noodle. 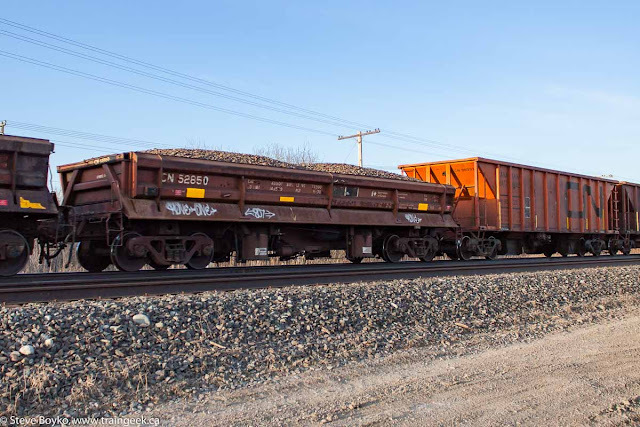 A third series of CN maintenance of way cars purchased for the branchline rehabilitation program is the CN 528xx series of air dump cars, built by Hawker Siddeley Canada. It appears to have been a pretty small series. So far I have discovered photos for CN 52899, CN 52850 below and this one. National Steel Car built the series CP 456000-456325 for Canadian Pacific for branch line rehabilitation work. These cars were painted black with a large CP "multimark" at one end. These cars have received the reflective stripes and AEI transmitters, and you can see from the above photo that the doors appear to have been modified, based on the fresh stenciling. I have seen these cars in solid blocks used for ballast work. 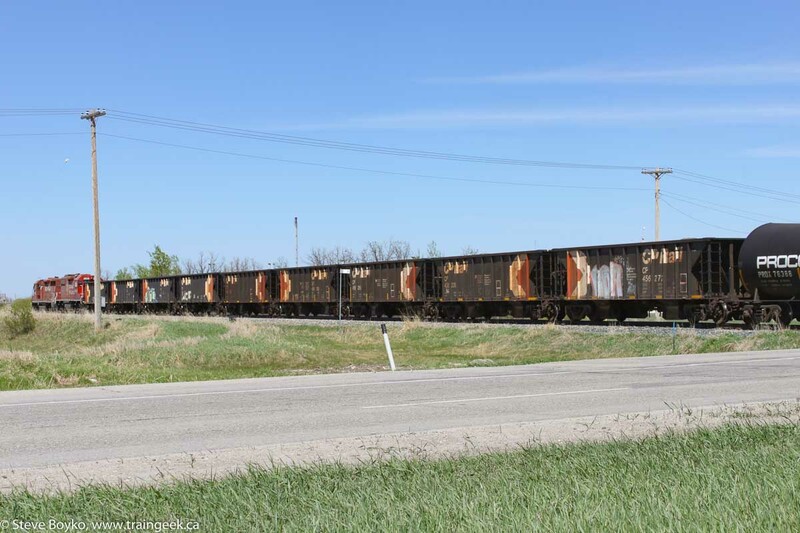 Many of the existing grain boxcars were rehabilitated as well. These boxcars continued to serve the light branchlines that were not upgraded, and some continued to serve the Churchill line in Manitoba until that was finally upgraded to handle the cylindrical grain hoppers. Both CN and CP boxcars were rehabilitated. 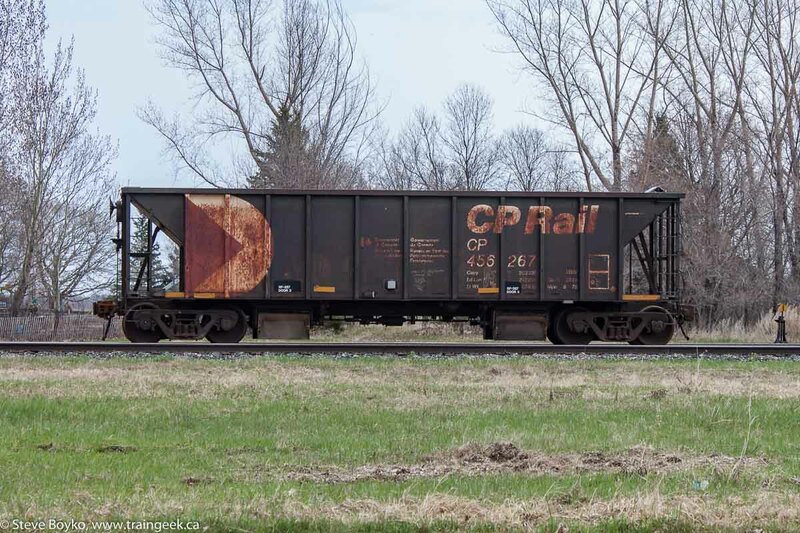 According to Eric Gagnon's excellent article, the CP boxcars lasted in service until 1996. CN's boxcars lasted until the end of 1996 in Churchill service, again according to Eric Gagnon. 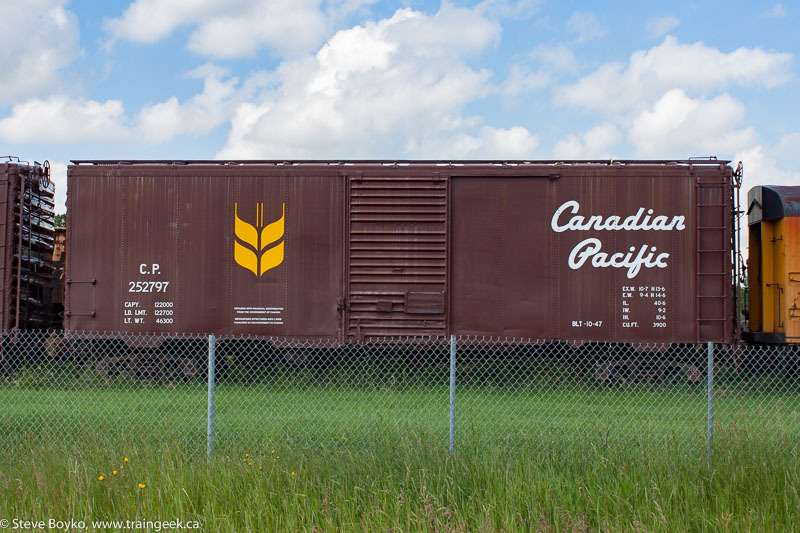 Some 1,000 40' boxcars were rehabilitated starting in 1985 with money provided by the province of Manitoba, for Churchill service; these boxcars wore a bison logo and were nicknamed "Buffalo boxes". 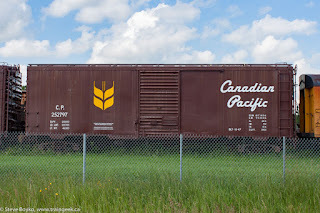 Cars rehabilitated under the federal program bore the wheat sheaf logo seen on this CP boxcar stored in Beiseker, Alberta. There's a great article in the March 1999 Branchline magazine, "The 40-foot Boxcar's Last Dance" by David Maiers. Recommended. No 40' boxcars exist in revenue service. A few may survive in maintenance-of-way service for CN or CP. 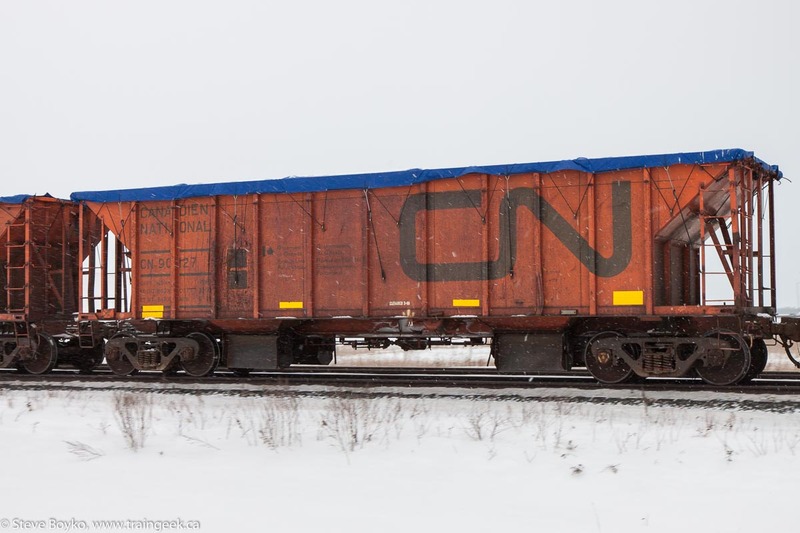 CN side dump car - ??? 40' CP grain boxcars - Intermountain - #46822 "ready to run"
TrainsCanada also offered a series of CP grain boxes in addition to the CN ones. Walthers ballast cars have been produced in HO and painted in both CP Rail and CN -- no need to strip and repaint. Note this model is a stand-in for CN and CP and is closer to a similar car operated on BC Rail. The TC 40' box cars featured 8' doors, while the grain boxes had 6' doors. I find it odd that many lines were rehabilitated (too strong a word perhaps - duct-taped back together) in the 1980s, only to be abandoned a decade or so later. See the CPR ballast cars often enough. Great write up Steve. You're right, Billy, I should have mentioned they had CP grain boxcars as well. Corrected. I didn't know that, Manny - I had looked on the Walthers site and didn't see those. I guess they are out of production. I see three-packs were selling on eBay for about $70. Great recap of the history of these branch lines and the associated cars that were associated with this program. You've filled in some gaps for me. I've seen some of these cars in Ottawa and snapped pix of a few. Now I know a little more about them. Hi Manny, the problem with the Walthers CP ballast cars is that they lack the branchline rehabilitation decals. I guess they could be added afterward!